Targeting the benefits of an exercise bike and an elliptical, the ProForm Hybrid Trainer gives you a diverse workout that most other machines can’t. In just three quick steps, you can adjust the Hybrid Trainer to accommodate an elliptical or bike position. Plus, the console adjusts, so whether you’re sitting or standing, you can easily monitor your workout on the large LCD monitor. 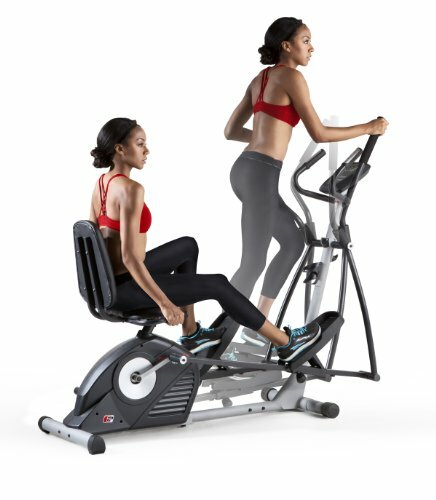 Featuring upper-body workout arms and oversized adjustable pedals, the Hybrid Trainer provides total-bod elliptical training and low-impact recumbent workouts. All ProForm refurbished products carry a full 90 day Factory Warranty from Icon Fitness, the leader in home fitness equipment. The product you are purchasing has gone through Icon’s rigorous testing and refurbishing program at their factory facility in Utah. Each model is placed through a complete 50-point process to ensure the standard of quality and longevity customers through the years have come to expect from ProForm. With the combination of Icon’s Factory Refurbishing Program and backing of 90 day Warranty covering both Parts and Labor, you can be assured that this product is ready to get you on the road to fitness right away.